Working long hours caring for one of Guatemala's largest coffee plantations and managing six children would leave most people little time to volunteer. Jose Maria Pos, 41, thought the same thing when the Mitzimal farm manager asked him to become the community's river blindness (onchocerciasis) health promoter. "At the beginning I thought of the inconvenience, but finally I decided to accept the position because I knew I could help not only myself, but also the people living on this farm," said Pos. Pos has had six nodules removed from his head and mid-section, one of the few treatment methods available to fight river blindness until the drug Mectizan® became available in 1987 from Merck & Co. River blindness is a parasitic disease transmitted by the multiple bites of black flies, which insert a microscopic parasitic worm into victims. The worm's offspring swarm through the body, especially the skin and eyes, causing intense itching, skin discoloration, rashes, and eye disease, sometimes including blindness. Working on the farm full time since the age of 17, Pos noticed that he started to develop problems with his eyes. He couldn't see clearly and his eyes would constantly water, especially his right eye. Losing his sight would have had a devastating effect on his family. When Pos heard about Mectizan, he insisted on being one of the first people in his community to take the medication. "After the second treatment round, I saw my eye problems all disappear, and since I've been taking Mectizan, my only other nodule has spontaneously disappeared without having it surgically removed," Pos recounts. The economic impact of river blindness in the Americas and Africa has been enormous, preventing people from working, harvesting crops, receiving an education, or caring for children. In coffee producing countries like Guatemala, contracting river blindness is an occupational hazard because the coffee is usually harvested on farms along the fertile banks of fast-flowing streams where the black flies breed. In the Americas, 180,000 people are infected with river blindness (onchocerciasis) in Brazil, Colombia, Ecuador, Guatemala, Mexico, and Venezuela. Today, Pos's entire family and community take Mectizan twice a year as part of an effort to eliminate the disease from the Americas in the next decade. Pos proudly wears his aqua blue OEPA (Onchocerciasis Elimination Program for the Americas) volunteer shirt with matching aqua cap and backpack whenever he is fighting the disease. While showing his new health education flip chart, Pos explains the health education and disease prevention program has become better and better, "I remember that at the beginning of these activities we had very few tools to help us, but now we have a lot of training. I have materials not only to teach myself, but also to teach the rest of the people here." Distribution is no small task: There are rotating schedules to juggle, difficult terrain to tackle, stubborn personalities to overcome, and lots of curious questions to answer in community when the drug is distributed twice a year. 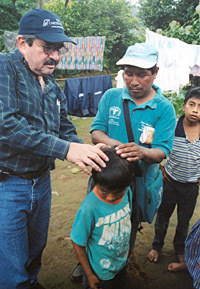 Recently, the Carter Center's International Task Force for Disease Eradication stated that onchocerciasis could be regionally eradicated from the Americas by treating 85 percent of the endemic population with Mectizan every six months until disease transmission is stopped. Where does Pos find the time to treat everyone in his community? "I don't take any time from my job for my onchocerciasis activities," stated Pos, who calls on people very early in the morning or right after he finishes his field work to ensure everyone has been treated. His dedication and hard work have earned him a trusted reputation in the community, and people now ask him not only for advice about river blindness but also about other kinds of disease, and even about matters not related to health. "I receive a lot of thanks from my neighbors, and it makes me proud," he says sitting up a little straighter. "Being a volunteer has made a difference in my life." "These days we have to fight against the disease, but I believe that in very few years, we are going to eliminate the disease, and our children will not have to take Mectizan or any kind of drug." In the fall of 2003, the Carter Center's River Blindness Program celebrated the delivery of more than 50 million treatments in 11 countries in Africa and the Americas since 1996. The Carter Center, in partnership with Lions Clubs International Foundation, Centers for Disease Control and Prevention, Merck & Co. Inc., and each of the national programs, have prevented millions from contracting onchocerciasis through the distribution of Mectizan and health education. In each country, The Carter Center works directly with the ministries of health, establishing accountability and building sustainability, which are crucial elements in the fight against river blindness. Jose Maria Pos, volunteer river blindness health promoter.